“This is stupid,” I try to tell myself. 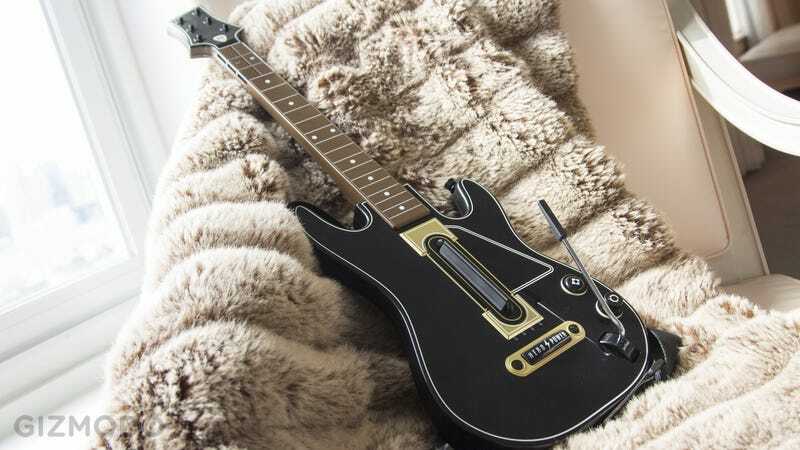 “Weren’t music games just a fad?” For one long minute, I struggle to hit a single note on my plastic axe, as game developers and PR people fire eye-daggers into the back of my head. But then, all of a sudden, it clicks. I’m strumming up a storm. I’m playing the new Guitar Hero—and it’s surprisingly awesome. “Want to know how long we’ve been making this? It’s this long,” laughs Jamie Jackson, the game’s creative director—gesturing to his beard. As you can see, the man has a chin worthy of respect. And yeah, it’s strange to think that we’ve gone nearly five years without a new Guitar Hero game. Music games kind of fell off a cliff back in 2011, after enjoying enormous success. Now, both Rock Band and Guitar Hero are coming back. But how will Activision get us interested in picking up a plastic axe again? Sure enough, I was banging out notes just like before on medium difficulty—but I also found myself intrigued by harder settings where you have to move your three fingers back and forth on the frets—or hit both together—instead of just up and down the guitar neck. Well, a little bit of that shame is back, but it’s way more entertaining. 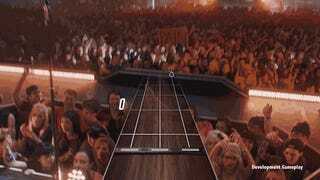 Now, every major Guitar Hero song is a first-person music video designed to make you feel like a rockstar on stage, where you feed off the energy from fans cheering for you—or booing you when you fail. The game keeps track of whether you’re doing well or poorly in real time, and can switch between an audience that loves you or hates you on the fly—using giant robot cameras, the developer filmed two versions of every single video frame with those two different audiences: one cheering your name and singing back your songs, and one holding up nasty signs. You don’t fail anymore and get booed off stage completely: you just feel horrible for letting down your fans and bandmates. 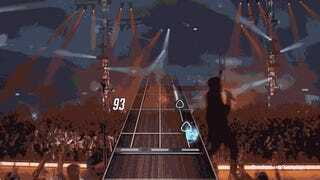 The new game’s called Guitar Hero Live, and it’s coming this fall for $100 to practically every console you can think of: PS4, PS3, Xbox One, Xbox 360, and Wii U. Mobile devices, too. Activision says there’ll also be a version for phone and tablet that you can plug into a TV with an HDMI cable, and use a full-sized guitar with too.